Nothing will spoil your day like the eruption of a nearby volcano, causing tons of ash and rock to rain down on you. A much more powerful event — perhaps 100 times bigger — happened on the Greek island of Santorini, also known as Thera. In fact, the island itself was the volcano. When seen from the air, or from the little town of Fíra perched on top of the island, the caldera is apparent. It must have been one hellish explosion, and it buried the town of Akrotiri, on the southern end of Santorini, for about 3,500 years. Akrotiri was a Minoan community — Crete is roughly 70 miles away — and the residents were busy making stuff with their Bronze Age tools when the ground began to rumble and then spewed fire. Scientists disagree about the date; opinions range from around 1500 B.C. to one guy who insists it was exactly 1646 B.C. He bases that on ice core dating, and a Members Only jacket found in the rubble. The site was discovered in the 19th century by workmen who were quarrying pumice to make cement for construction of the Suez Canal. Systematic excavation by scientists didn’t really get going until 1967, though, and to be honest, “systematic” may be a generous characterization of the process. When we visited in the 1990s, archaeologists were only able to dig about one month out of the year due to lack of funding. Still, they have found some fascinating stuff under all that old dirt: lots of pottery, furniture and walls decorated with beautiful frescoes. 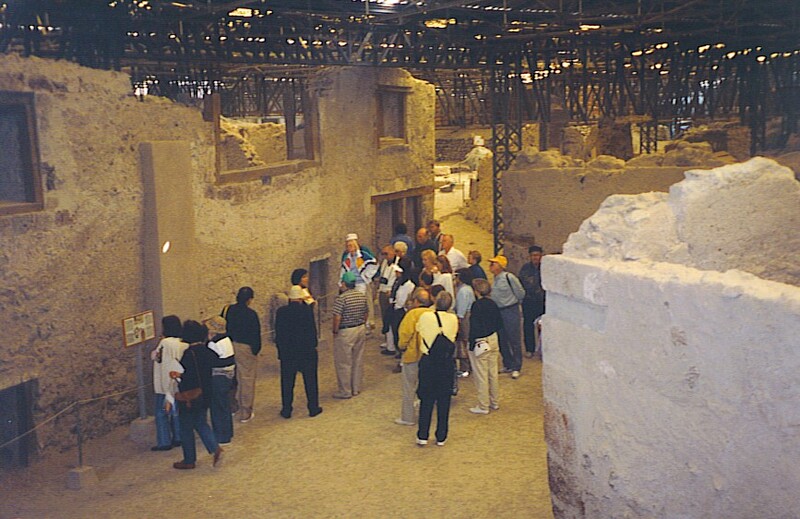 The residents of Akrotiri weren’t living in huts by any means — some of the buildings had multiple stories (see photo). Our guide got breathless describing the ancient drainage systems discovered there. Two things that haven’t been found are 1) gold in any significant quantity, and 2) human remains. This suggests to scientists that there was a relatively orderly evacuation of Akrotiri prior to the eruption. The hypothesis is that a series of earthquakes preceded the main event by several months, convincing the residents that it was time to pack up their valuables and get out. In other words, Akrotiri had been abandoned before it got buried. Maybe so. And maybe the fleeing Minoans got just far enough away to be caught in the tsunami waves generated by an explosion estimated to be the equivalent of multiple atomic bombs. In any case, the only documented fatality at Akrotiri occurred in 2005. There is a roof over the archaeological site (see photo again); a portion of it collapsed, killing a British tourist and injuring several others. Because of that incident, the site has been closed to visitors, although there is talk that it will reopen “soon”. As you may have read, however, there is virtually no gold to be found in Greece’s treasury either, so they may keep saying “soon” for a very long time. This entry was posted in Science, Travel and tagged Akrotiri, Greece, Santorini. Bookmark the permalink. So interesting- Is this one of your trips? Yes, it was a number of years ago. At the time I wondered why a Greek island would have a name like Santorini, which sounds Italian. In fact, the locals call their island Thera, sometimes spelled Thira. Long after we were there, I found out that the Latin-sounding name means Saint Irene, who was a Greek martyr. Whatever you call it, it’s visually very dramatic, with whitewashed houses on the precipice of steep cliffs — beautiful!